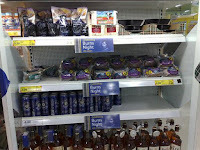 Tesco are encouraging shoppers to embrace Burns Night with sales of haggis, Scottish cheese and super strength Tenants. Shocking. I mean, where's the Buckfast?